Next Friday, the day after Thanksgiving and the following Saturday, fishing, crabbing and clamming in Oregon will be free for both Oregon residents and non-residents. The official dates for the free fishing days will be November 24 and 25. That means no licenses, tags or endorsements are required on those days. Even if you already have a combined angling tag, you are not obligated to mark down your salmon or steelhead on the free fishing days. However all other fishing regulations apply. At this moment a seasonal closure for crab is in effect in the ocean, and crabbing is still closed in bays from the Coos Bay north jetty south to the Oregon/California border due to elevated levels of domoic acid toxin. So basically no crabbing is allowed at this time anyway. Also, razor clam harvesting is prohibited from Cascade Head to the Oregon/California border. Here’s how I look at free crabbing and razor clamming during a closure. Being offered the chance to crab or dig for toxic shellfish on free fishing days is kind of like being offered a filet mignon steak when you’re allergic to beef; or presented with a free prime rib dinner when you’re on a diet. But hey, thanks a lot for the offer, pal! But just in case Mother Nature decides to throw us a bone, make sure to call the Oregon Shellfish Information Hotline at 1-800-448-2472 in the event that shellfish regulations might conceivably change. So what will the weather be like next Friday and Saturday, on those free fishing days? That’s only 6 or 7 days away, so anything can happen. Tell you what though. 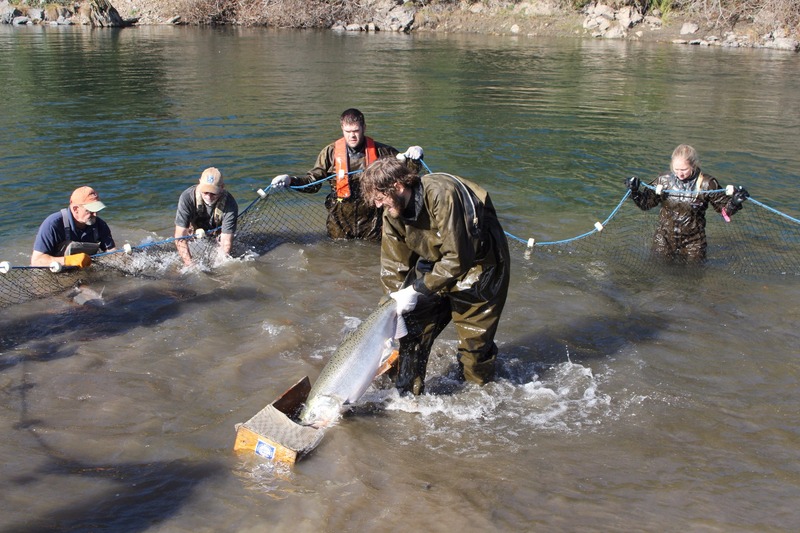 Everyone will be praying for good weather because if you do catch a salmon or a steelhead on the Chetco on any of those free fishing days, you are not required to mark them down on your tag. But all kidding aside, the Chetco River has been producing some hog-meisters when the river has pulled into shape. 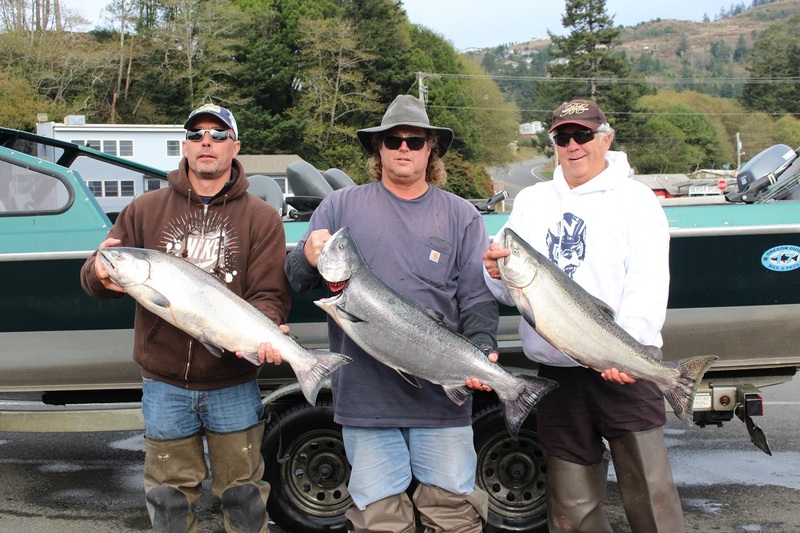 Like it did last Sunday when Father Chetco decided to drop toward 3,700 cfs and several fishing guides were successful on the water. And there were some hawgs caught. I saw several Chinook over 25 pounds and some photographs of some kings over 40 pounds. In fact, there’s been so many 40-pound kings caught this season that I would not be surprised one bit to see a 50 pounder caught this weekend or into the following week. So what is the weather going to be like this week? The National Weather Service is predicting a repeat performance of last week. If their prediction comes to fruition, drift-boaters will be pulling plugs on Sunday, when the NWS is predicting that the Chetco will again be dropping toward 3,700 cfs. If that happens, you better have a Hawg Nose FlatFish on the end of your line with a sardine wrapper. To the uninitiated, a sardine wrapper is not about a wordsmith chanting about eating fishy hors d’oeuvres and sushi-like appetizers. It’s an actual fillet of a sardine with the skin left on that is held onto the belly of the plug with Miracle Thread – skin side toward the lure with the flesh facing outward. It’s about 1/3 the size of the plug, but the size varies from fisherman to fisherman. For precise instructions on how to use plugs for salmon and how to trim the fillet, you might want to buy a small inexpensive booklet called “Plug Fishing for Salmon” written by yours truly. The booklet fits nicely inside any tackle box. After filleting one side of the sardine, you basically trim the fillet into a rectangle with a pair of scissors and then slit one half of it to look like a pair of pants. Placing the slit over the belly hook, simply wrap around the plug with your Miracle Thread from bottom to top. Anglers were also catching salmon last week by using tuna belly fillets as well, a technique that has grown in popularity in recent years. The technique of plug pulling is fairly easy but it has a steep learning curve. Basically the person rowing the drift-boat gently eases the plugs into slots, riffles, chutes, tail-outs, current seams and all other sorts of salmon-holding water. The strikes are savage and the take-downs are vicious, so make sure to keep your rods in their holders. And get ready for steelhead. A few metalheads have already been caught on the Chetco. Next week just might be the time to stuff a steelie for Thanksgiving. Larry Ellis, author, writer, columnist and photographer has had a 50-year passion for fishing in California and Oregon's saltwater and freshwater venues. 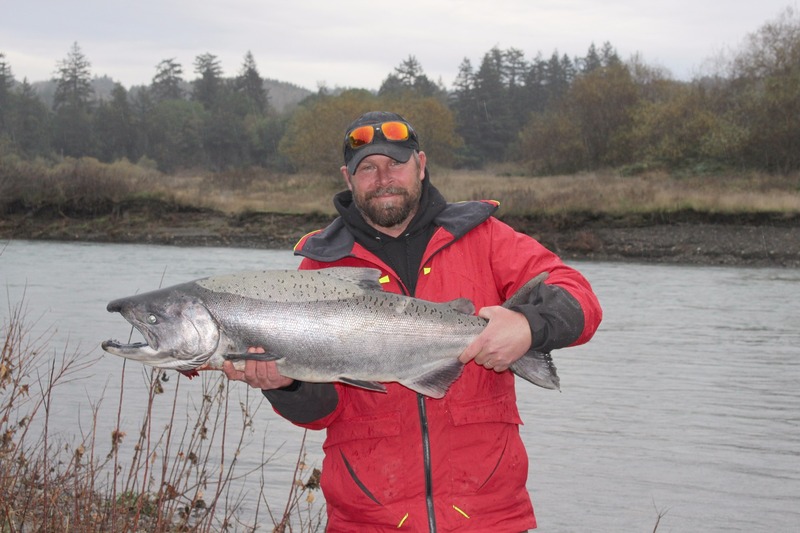 He is a well-known writer for Oregon, Washington and California Fishing and Hunting News, Northwest Sportsman, California Sportsman and Pacific Coast Sportfishing. He currently writes monthly for Salmon Trout Steelheader Magazine, and is the author of two books, "Plug Fishing for Salmon" and "Buoy 10, the World's Largest Salmon Run." Both books can be bought from Amato Publications (amatobooks.com), Amazon and eBay. Ellis particularly loves living in his hometown of Brookings, Oregon - The heart of salmon country and gateway to fishing paradise.